The Indie Royale St. Patrick's Day Bundle is here, featuring Hard Reset, four other games and some bonus stuff for the non-cheapskates. Another day, another bundle, this time with a distinctly Irish flavor thanks to the inclusion of Hard Reset, the action-packed shooter released last year by Flying Wild Hog, a new studio based out of Warsaw, Ireland. [Warsaw's in Ireland, right?] It's an old-school blast and a wickedly good deal in a "pay what you want" deal, but there's more! 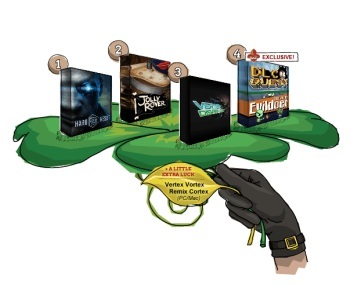 The St. Patrick's Day Bundle also includes Jolly Rover, a 2D point-and-click adventure; Vertex Dispenser, a "fast-paced abstract strategy game with mathematical puzzle elements"; the industry-mocking DLC Quest; and Lair of the Evildoer, an "action-RPG-shooter" with 20 procedurally-generated levels of pure evil. And if you pay more than the minimum, which at last check was a little over five bucks, you'll also get the 15 song O.S.T. : Original Soundtrack, an NES-inspired musical tribute to videogames of old. There are still nearly four days left on the clock but you know the deal: the more the Indie Royale sells, the higher the price goes, so get on it quick if you want the best price - or you can force the price down for your fellow gamers by paying more than you have to. Either way, this is another solid bundle no matter how you look at it, so go look at it at indieroyale.com.